I woke up early that morning. The rush of excitement to see my friends, family, and all the planning of the past few weeks filled me. Of course there were still more things to do, like the set up and making sure all the food got there. Then there was getting ready and making sure I put my feet up before I’d be on them all day. While I was constantly going over this checklist in my head, Jensen’s assuring ‘Go Mom!’ kicks made me smile. When I stood up from my bed, I swore Jensen had dropped even lower. His weight gradually had been getting lower and lower over the past few weeks, but today he was the lowest. I waddled down the steps and we all started moving everything to the car. There was all the decorations and the table clothes that needed setting up before anything else, which was perfectly fine with me. As usual, I had to wait until after ten to get something to eat. Mr. I-don’t-like-mornings still hadn’t let me eat breakfast like I normally did before I was pregnant. The boxes of my mental checklist were being marked quickly. On days like these, the hustle and bustle makes time go fast. Before I knew it, the guests were arriving. I greeted people as they came. The first thing they probably noticed was my huge belly and my white slippers because no shoes would fit right. It seemed like the whole room filled up in under twenty minutes. Everyone was talking and laughing. Jensen kicked when he heard different people’s voices. I imagined this was how it was going to be from now on. His presence in the world brought happiness already and it would continue doing so when he would be in my arms. My mom told me to go in the back while they played their first game, so I could eat. I can remember eating and a little one came up to me and asked what Jensen was doing in my belly. I smiled and told her he had been sleeping because we had a busy day. She touched my belly and asked if he was right there. Then he kicked. He was going to be friendly and love to interact with his cousins and friends. After I was done eating, I remember walking out the door and seeing the huge, blue, ‘BOY’ balloons with the presents on the one side and diapers on the other table. I felt so blessed that Jensen and I were loved by so many. The games had finished and everyone was eating. It was the perfect time to start opening gifts. I opened clothes, diapers, car seats, gift cards, pacifiers, books, stuff animals, bath needs, towels, and anything else you can think of. It was all there. We only needed to get a stroller which would be covered with all the gift cards. 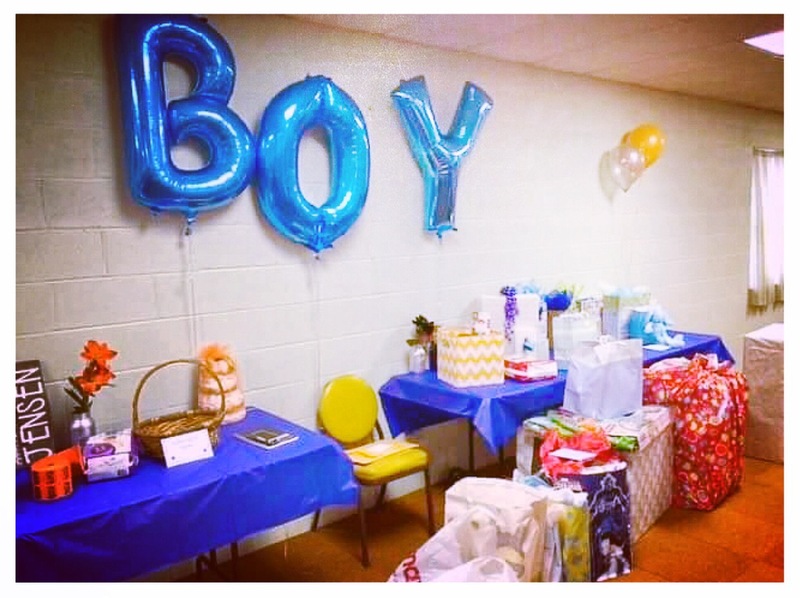 Everything was set for his big arrival now. All I had to do was get everything washed, unpacked, and assembled. Those things and of course waiting. When everyone was getting ready to leave, I hugged them all and felt Jensen moving around. It was a tight squeeze so I felt him pretty frequently. In between every goodbye, I laid my hands where I knew his put was and then would trace down where his back was. He liked when I did that. He would move to follow my hand. Now looking back, a lot of those goodbyes were the last ones he had. They departed from us happy and thinking our future would be bright. No one ever expected the worse was about to happen in a few short weeks. My family helped take all the presents back to my house. We had to put them in the closet/laundry room because we still had to figure out everything with his room. I remember we went through each outfit and every book. In my mind, I had to organize everything so it would be easier for us to put away. Diapers in one corner, the bathing stuff in the other, and everything else had its place too. The clothes came with us so they could be washed. Then we went home. Happy with how they day played out. I spent the evening reading the ‘Wishes for Baby’ and ‘Advice to Mom’ cards. Each out loud so Jensen would most definitely hear. I put them back in my purse so I could read throughout my appointments and ultrasounds, or whenever I felt like I needed to see them. I was going to be a great mom. That thought played in my head over and over. I was nervous, but I saw how much he was loved and I knew everything would work out just fine. As quickly as the day went by, sleep welcomed me. Jensen and I had our nightly routine of reading a book and him kicking me until I laid on my left side. I’d be seeing him the next day and letting the ultrasound technician know how the shower went. I dreamt of what he would look like that night. We were in the hospital room and I was holding him. He was snuggled so close to me and I was humming a lullaby in his ear. His body was warm and his hair smelled like a new baby. Everything was perfect that day. This entry was posted in grieving, Jensen, stillbirth and tagged angel baby, baby, baby loss, baby shower, blog, child loss, grief, grief attack, grief journey, grief work, grieving, infant loss, infant loss awareness, Jensen, Jensen Grey, journey, life, life after loss, loss, loss community, love, mama grief, Pregnancy and Infant Loss, Pregnancy and Infant Loss Awareness, stillbirth, stillbirth awareness, stillborn, Stillborn Still Loved by danielleridgway. Bookmark the permalink.